Dogs are known for their loving, caring nature. Whether it’s their wagging tail or four legs running beside you, they have been your best friend for about 15,000 years. Dogs are a great source of relaxation and companionship during tough times or any times, for that matter. As social media has grown and computers have gotten smaller and able to fit in the palm of our hands, we’ve become plugged in. Our reliance on technology and link-clicking can isolate us from other people. To get away from the pressures at work, familial demands on your time, and your own internal pressure for success, sometimes you may just want to throw a ball and have your lovable dog go get it and bring it back. A dog provides many years of loyalty, companionship, and honestly, are free from the hassles and stresses that can come with being around humans, children or adults. You don’t have to argue with the dog or compromise much with the dog. But, even though you don’t speak the same language, if you have been around a dog for any length of time you know how well they can communicate without speaking. Tail wagging signals their excitement, looking at the faucet tells you they’re thirsty, a hanging head tells you they did something wrong, and those big eyes tell you they could use a hug. For the most part, dogs only need a few things: food, shelter, some toys, and love. Love is the biggest thing that dogs need. Like us, they are very social and need a lot of companionship and attention. So, what are some ways that dogs have saved your life? Let’s discuss a few. Other than walking every day, some other benefits of taking your dog to the park or around your town include stronger bones and cardiovascular system, lower blood pressure and more smiles. You may notice some things you wouldn’t have noticed if you were walking with a human walking partner. Whether this is because you’re walking too quickly or chatting about work, with your dog you’ll see more because your dog will insist to stop and smell the trees. Your dog will keep you more accountable. While you might make a quick call and blow off your friend when you don’t want to get up and do much of anything, the excitement radiating from your furry friend is too much to bear. There’s nothing like seeing an excited dog. 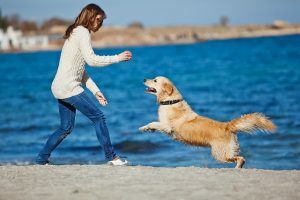 How do you feel when a Golden Labrador is running towards you? How do you feel when a puppy is trying to get up the stairs? With just one look, dogs can make you smile, which improves your mood. 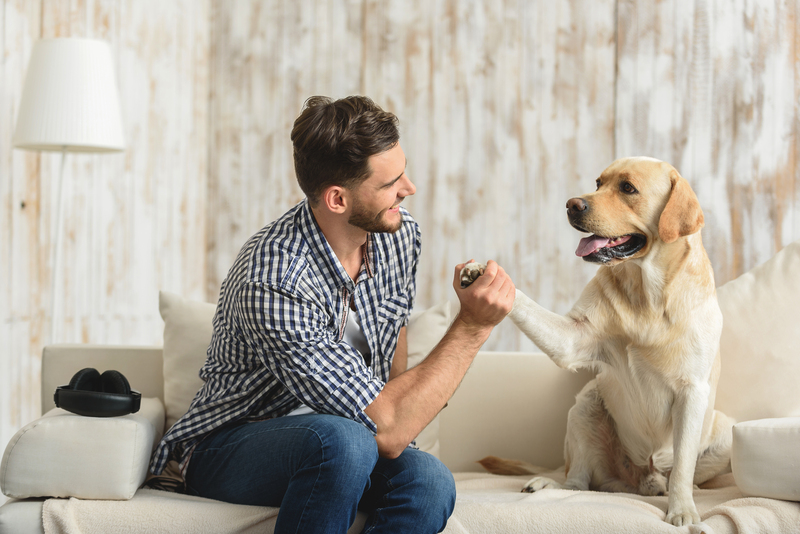 There are many studies that show stress hormones are reduced after interacting with a dog for just five to 20 minutes. As you talk or play with your dog endorphins will be released and happiness will replace the stress. Five to 20 minutes is a much faster response time than a mood stabilizer or antidepressant. Oftentimes, when we need a shoulder to lean on, we may go to our dogs. If you have a large dog, you may literally lean on their shoulder. And, if your dog is small, you may hold them in your lap and pet their fur. This rhythmic nature combined with the softness of their fur is very comforting and can help you feel better. Dogs give you a non-judgemental, patient, shoulder to cry on. They care about your pain and do everything they can to make you feel better. If you have ever been witness to a traumatic event, criminal court cases promote well-being with emotional support dogs. These professionally trained animals help you deal with the trauma and emotional strain of the event. Formally known as a service dog or psychiatric service dog (PSD), these specially trained dogs are used to help people with physical, mental, or developmental disabilities. For each disability category, the dog can have similar and also different responsibilities. For physical disabilities the dog may assist with opening doors, getting items, or increasing traffic safety, for instance, if the person is visually impaired. For mental disabilities, such as PTSD, anxiety or depression, schizophrenia, or bipolar disorder, the dog may be there to help the owner out of a flashback or dissociative state (PTSD), alert them of a manic episode, hallucination or panic attack (bipolar/schizophrenia/panic disorder), or assist them with leaving the house more often, going to a grocery store or talking to others (anxiety). For developmental disabilities, such as autism, service dogs can be used for a variety of reasons. They can be used to calm the child or adult, to facilitate social interactions by helping with ice-breaking activities, and to find them if they wander. Many children and adults with autism blossom when around the dog’s non-judgmental nature. They may speak more, read aloud, or feel more comfortable talking to other children or adults. If they’re nonverbal, a PSD can help them stay tuned into their external world and regulate their senses better. 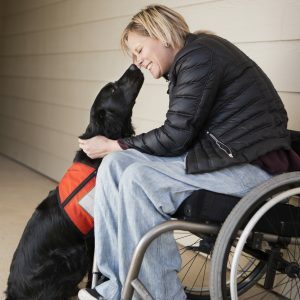 To receive the full benefits, and access to public spaces, your dog must be registered as a service dog and certified through the Americans With Disabilities Act (ADA). For all the benefits of being around other humans, the truth remains that many relationships have conditions. Humans have wants and needs, and most relationships are not like that of you and your dog. While your dog does expect food or water, their unconditional love is without strings. The more a human likes you, the better they will treat you. And if they don’t like you, they may treat you very poorly. Whether you are a good or bad caregiver, hopefully, you are a good caregiver, your dog will love you regardless. No matter how large your dog gets, it will still need care. To be fed, given water, and given love. For many people, a dog is so much more than just a dog. It’s so much more than just a four-legged creature with fur and a wet nose. A dog can be a family member and the loss of this dog can set the family back. Unconditional love, a nearly stress-free relationship, and a companion throughout life, a dog is a great choice. Sometimes, you just need to be listened to without judgment and loved without questions.